We have been traveling up and the down the ICW for over 20 years now and have our routine ice cream shop stops pretty well set. (See Cruising World Sept. 2012 issue.) 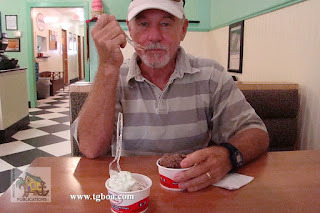 But although we are originally from the Chesapeake Bay, we had never spent months just leisurely circling the Bay and sampling all of the creamy, sweet delights it had to offer. The summer of 2013, while researching our Chesapeake Bay anchorage guide for our Great Book of Anchorage series, we decided to do research of a slightly different and more fattening kind.